Last night in our writing group, we critiqued the outline, introduction, and first few pages of a member’s new book. At least, I hope it will become a book. She has a terrific idea, one of the best developed outlines I’ve ever laid eyes on, and an upbeat, yet educational voice to her work. While everyone in our group was impressed with her outline, I was absolutely awed by it. As a person who usually develops her outline after the fact, I need to take some lessons from Mary Anne. That’s not her real name; I’m just using it until she gives me the go-ahead to use her real name. 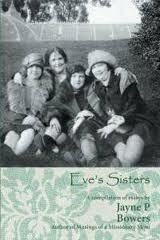 After reading and pondering Eve’s Sisters (you know I have to mention my book, right? ), Mary Anne, who happens to be single, realized that while people have written about mothers, daughters, harlots, queens, and widows, no one has written much about single women in the Bible. For that matter, there’s not that much information about them in Christian literature either, at least not in the writing Mary Anne has seen. Her mind is abuzz with ideas about self-worth, attractiveness, qualities to look for in a companion, and at least another dozen topics. Lest anyone thinks that women in the Bible are boring or sugary sweet, maybe reading Eve’s Sisters will give you an entirely different perspective. While it’s true that I could never live up to some of them like the virtuous woman in Proverbs, I can surely identify with most of the others. Women everyone have occasional esteem issues and moments of self doubt (Do I look fat in this skirt? ), and so did many women in the Bible. They struggled with their husbands, children, poverty, looks, fear, age, and a host of her psychological issues. What I’m saying is that the Bible is a treasure trove of stories about women with emotions and experiences just like the women who walk the earth today. They didn’t have to worry about changing fashions, Botox, and breaking through the glass ceiling, but they had their share of challenges, some of which make ours look mild by comparison. For instance, one emotion that can be a real dream slayer is fear. Women are afraid of failing and afraid of winning too. They’re afraid of being turned down, saying no, and getting old. Sometimes they’re afraid of doing what it takes to say YES and live their lives to the fullest, especially if it means getting out of their comfort zones. Until a couple of years ago, I’d NEVER thought of just how often fear is mentioned in the Bible and just how much courage it takes to go for it. That was before I met Queen Esther, one of my new role models. Stay tuned to learn more about her tomorrow. This entry was posted in books, writing, writing groups and tagged books, writing, writing groups. Bookmark the permalink. An excellent idea! I’m part of a writing group myself and I reckon some of us could benefit from publicising the basic plot of our novels. It might give us an idea whether the book has a chance of being published or not. I have some stories on my blog, though aimed at younger readers, which you might like to read and comment on. Thanks for commenting on my blog. Yes, I definitely will read about Cheeky Cheesecake. I have some grandchildren who would enjoy his adventures too.